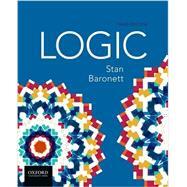 Featuring an exceptionally clear writing style and a wealth of real-world examples and exercises, Logic, Third Edition, shows how logic relates to everyday life, demonstrating its applications in such areas as the workplace, media and entertainment, politics, science and technology, student life, and elsewhere. Thoroughly revised and expanded in this third edition, the text now features nearly 2,800 exercises, more than 200 of them new; updates throughout; and a revised and expanded ancillary package. Stan Baronett is the author of Logic, Second Edition. Each chapter ends with a Summary and Key Terms.